Born in Harlem, New York City in 1909, Norman Lewis was a painter of Bermudian descent. At the time of his birth, Harlem was a racially unbalanced neighborhood with a majority population of Italian and Jewish residents. He was one of the few African-Americans in the area; this environment would serve as the building blocks for Lewis’ upbringing and shaped his outlook on racism. Hoping to be able to visually show the everyday struggles of the African-American community, Lewis decided on his future career as an artist when he was only nine years old. In the 1960s, Lewis created the Spiral group, a handful of artists who attempted to discuss the massive potential African-American artists had to convey racism and discrimination at the time. Although short-lived, the positive racial impact it had on the art world was significant. 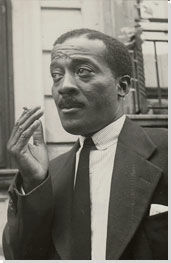 Because of his skin color and his involvement in politics, Lewis was widely disregarded as an artist and few paid attention to his work. Throughout his career, several art exhibitions overlooked him, some of which were for mainly white artists. Many African-American galleries also rejected him, as his artwork was extremely abstract and couldn’t fit into either category; his work rarely sold in his life. As a result, he had to support himself and his family by teaching. It was only after his death that Americans were able to fully capture the power of his work, and were able to recognize his legacy. One of his paintings sold for $800,000 at the Swann Auction Galleries in 2016. The hardships he faced as an African-American artist, along with his incredible painting style, make him one of the most inspiring figures in black history today. Below is a digital copy of Phantasy II, one of his most recognized pieces of abstract work.